For the World Pyro Olympics, 2009 will be different. A new venue -- The Fort Open Grounds at Bonifacio Global City. 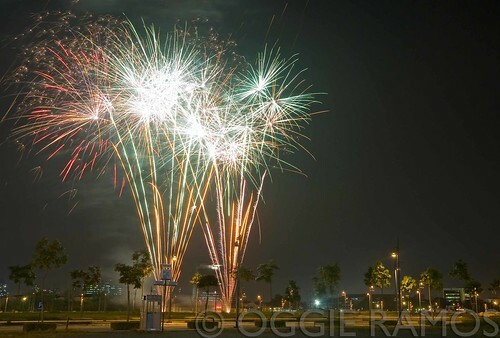 A new twist - the country's first-ever pyro-musical with fireworks choreographed to music. And a new approach -- a virtually whole-day affair starting at 3pm every Saturday beginning November 21 until December 19. From the roster of participants, the 2009 edition sounds really exciting -- past champions China (Glorious Entertainment), Australia (Explosive Productions) and Italy (Parente Fireworks) are joined by South Korea (Hanwha), Germany (NICO-Lunig), Japan (Marutayama), Canada (Pyro Studios) and the United States (Remote Effects Systems). 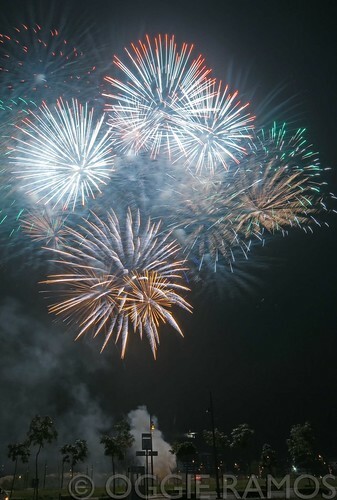 The Japan performance promises to be a spectacle worth queueing for as the featured fireworks group is the same one that has enthralled five generations of Japanese emperors. I've come to like the SM MOA as a venue for the past exhibitions because of the photographic possibilities along the bay although I understand that there were limitations there -- congestion and crowd control for example. For this year's edition, what's welcome news is the availability of shuttle service from different pick-up points. Details to be announced later in this blogspace. thanks bai :D swerte lang talaga. the time frame was too short to really anticipate ideal exposures. will look forward to shooting the longer performances. wow spectacular! sounds exciting. hope Philippines will continue to host big events such as this. thanks JP. I think La Mancha will continue to do so, according to its founder, Ric Crisostomo.